2014-15 - Literacy Volunteers of America, Essex & Passaic Counties, NJ Inc.
Click here to edFatoumata Kiebre came to Literacy Volunteers of America two years ago with only one thing on her mind: success. After emigrating from her native Africa, she found a job as a hairdresser to support her 5 children. Her goal was not only to help her children survive in this country, but also thrive. Fatoumata wanted to help her children with school, be able to effectively communicate with their teachers, and ultimately purchase books for her children and visit the library with them. She has done that and more. Recently, she attained her United States citizenship. Fatoumata’s tutor, Sharon Jones recalls their first meeting. “When I met Fatoumata, she did not know the alphabet, but there was something that greatly inspired her to read and write.” That “something,” Sharon found, was determination. After carefully assessing Fatoumata’s needs and goals, Sharon and Fatoumata began working with basic alphabet flash cards that contained upper and lower case letters. Next, Sharon introduced the sounds of each letter along with pictures to associate with that letter. “We started out with simple words such as apple, ball, cat, dog.” Using this same technique, Sharon gradually introduced increasingly complex words. Once Fatoumata had a good foundation, they worked on decoding words until Fatoumata was able to correctly figure out new words on her own. After about a year of intense study, Fatoumata brought a book to her lesson from the United States Citizenship and Immigration Services. Sharon sheepishly admitted she was shocked and wondered if her student was ready for this intense exam. However, she said, “I kept an open mind.” Sharon implemented different drills to help with the reading part of the text. For example, she chose words such as “President of the United States” and “White House” as sight words. Then Fatoumata began writing words and sentences on her own. While working very diligently at home, Fatoumata memorized each question and answer on the CD that accompanied the book. Of course, her study time was divided between preparing meals and tending to other needs of her children. 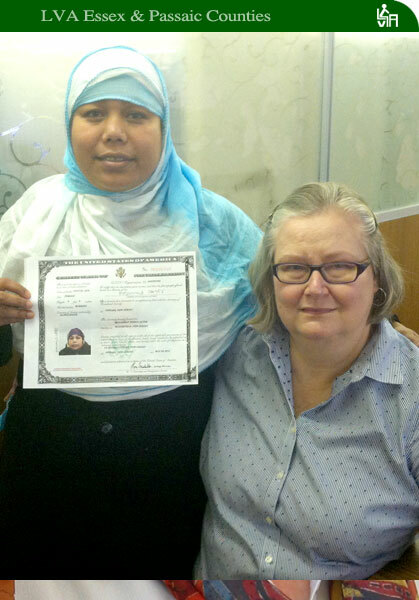 After an arduous ten months of preparation, in October 2014, Fatoumata took the citizenship test and passed on her first try. Fatoumata was ecstatic and her tutor shared in her delight. I was so happy, so proud, so overjoyed. She worked extremely hard and put in a lot of work and dedication. I knew she could do it because she never gave up on herself.”it. From the moment she enrolled in Literacy Volunteers of America, there was never any question about Mosammat Akter’s motives. Her husband and sons, ages 12 and 15, were already US citizens. Mosammat, an LVA student from Bangladesh, wanted to become one too. So for almost a year, she and Laura McLean, a tutor in LVA’s Essex & Passaic Counties organization, studied dozens of questions listed in a US government citizenship study guide. The longest river in the United States - - the Missouri, not the Mississippi - - had to be committed to memory. So did the number of elected officials in the House of Representatives (435) and the year the US Constitution took effect (1789). Then there are the speaking and reading portions of the exam. Test takers are asked to read a short passage to their examiner. Omit a “content word” – a word that gives the passage meaning, as in most nouns, verbs, adjectives and adverbs – and you fail. Pause for an extended period of time while reading and you fail. Make a pronunciation or intonation error that interferes with the meaning of the passage and, that’s right, you fail. Mosammat works six days a week at a Dunkin’ Donuts coffee shop, beginning at 6 a.m. She also raises two boys. Her study time is limited but she rarely misses a session with Laura, which takes place on Mosammat's only day off each week. Despite her preparation, Mosammat said she was nervous when she sat with a citizenship examiner last September. “She asked me six questions, I answered the six questions,” Mosammat said. “Then the writing, then the reading. I don’t know if I made a mistake but in the end, everything was good.” Modestly put, she passed. She is a US citizen. Mosammat said all the credit for her accomplishment goes to her tutor. She spoke briefly to the The Insider on a recent weekday, and then rushed off to try to get her brother and sister-in-law enrolled as LVA students. Laura McLean is recruiting too; she’s trying to enlist two friends, including a recently retired ESL teacher, as tutors. “I’m getting a lot out of it,” Laura said of tutoring. “I was determined when I retired not just to sit home. I thought ‘What do I enjoy most?’ I like to read. It’s good to share that." From the beginning, I knew that Arlin was going to be a really special student to tutor. She spent her earliest years in Puerto Rico where her schooling stressed neither English as a second language nor continuing education for a young girl. But Arlin was determined that she would press to get a good education. As a teenager she moved to New Jersey and was determined to set and meet personal goals, including mastering English. By the time Arlin entered the LVA program, she was bi-lingual. She already understood spoken and written English, and was a very good English-speaker. However, she needed work on her grammar and written skills so she could pursue an Associate’s Degree to enter the medical field. Because of her intelligence and that motivation, I’ve seen some really amazing changes in Arlin. When we began in February of this year, she was somewhat shy and reserved. Expressing her opinions an offering suggestions about improving lessons developed as we worked together. We look back on some of her early lessons and homework assignments and see that her progress is nothing short of amazing. Her essays have become well structured and clear. Now, when we go over them, she is able to self-correct and makes notes about the rules for those corrections. I often ask Arlin to write essays based on controversial subjects, giving and supporting her own opinion. Although she admits it is difficult for her, she does a great job each time. I got some insight into Arlin’s drive when she described how she trains six days a week in a strenuous Tai Kwon Do program. She is now at the 2 Dan level, meaning she already has two black belts toward a four-belt level, making her a Master. Plus, she runs a household of eight, including an extended family. This fall, she returns to college to pursue her Associate’s Degree, with the goal of becoming a Surgical Assistant. During my tutor training, I learned how important it is to inspire our students. How surprised I always am to find that it is Arlin who inspires me with her dedication and willingness to embark on new learning paths. We continue our lessons, concentrating on grammar and writing. I know that no matter how difficult the challenges, Arlin will always respond, “I’ll try.” And she does! Shegere and Isuf Balla made the arduous journey from Albania to the United States a little less than a year ago. They were in search of a better life for their family. They realized in order to better acculturate, learning English was their first step. to learning the sounds of the alphabet and flash cards. I repeat the words we practiced and provide new words each week. We are also working on social customs as well and begin each lesson by asking about each other’s weekend and elaborating on any highlights. Even though our sessions are enjoyable, they were hard work for all. As with any type of learning, progress was sometimes slow, then would pick up a bit and eventually even out. I also encourage them to listen to the radio, watch a ball game during which the play-by-play and color commentaries are deliberate and slow exchanges. I thought this would be a useful tool for Shegere and Isuf to develop the sound of spoken English. Both students are progressing. Recently, Shegere showed me her ID for her new job cleaning offices in Manhattan. This is a giant leap for her and she is very proud that she was able to understand questions posed to her during the interview. Isuf is still searching for employment; yet, he was able to get his green card. With his hard work and dedication, I am sure a job will arise in the near future. When I arrived at Bloomfield Public Library, I found my beginner English students checking out books at the circulation desk. The librarian quickly deflated my delight by telling me they were checking out books written in Spanish! She suggested that we visit the Children’s Library next door. So I abandoned the day’s lesson plan and Dayanna (24 years old, from the Dominican Republic,) Fernanda (29 years old, from Colombia) and I went on an impromptu trek to see what beginner English books we could find. At the Children’s Library, we were directed to the Picture Books section. Amidst all the juvenile books, something caught the corner of my eye. I picked up Museum Shapes by The Metropolitan Museum of Art (http://www.amazon.com/Museum-Shapes-Metropolitan-Art/dp/0316056987). For the shape ‘oval’, there was a picture of a beautiful young woman holding an oval hand mirror. Fernanda, an art lover, excitedly shared that she was familiar with the painting – Lady Lilith by Dante Gabriel Rossetti (http://en.wikipedia.org/wiki/Lady_Lilith.) Conversation revealed that neither student had ever been to the museum. So we decided to take a field trip to see if we could meet Lady Lilith in person. Our field trip to NYC provided infinite learning opportunities. Dayanna and Fernanda were able to practice reading the train schedule, counting money for the train tickets, talking to the conductor and asking for directions in English, reading subway and street signs, ordering food in English as well as practicing vocabulary words for shapes, colors, emotions, objects and numbers. New York City and the museum were their treasure chest. For my students, our trip breathed life into the words they have been diligently studying. For example, the one-dimensional three-letter words we studied to illustrate words ending in the consonant ‘N’ (bun, can) came to life when they saw ‘Hot Dog + Bun’ advertised on a food truck and a ‘Use the trash can’ sign in Central Park. They marveled at the mummies in the Egyptian wing and laughed as they practiced short vowel sounds by exclaiming, “Is the mummy a mommy?” And they relentlessly looked for shapes in the architecture, paintings and sculptures all around them. Elation was Nuray’s immediate reaction when she heard the words, “Congratulations, you are now an American citizen.” But, that was not her feeling when she walked into the test. She left her native country, Turkey, 12 years ago, and felt very isolated in the United States. After a while, she finally obtained a position as a part time au pair with a Turkish family. Nuray was in an insular community with little chance to learn English. Turkish was spoken at home between her husband and two grown sons. She decided to do something for herself and that is when Nuray found Literacy Volunteers of America. LVA paired her with a tutor that was a match made in heaven because they worked together so well. Nuray came to her tutor knowing very little English but that soon changed. 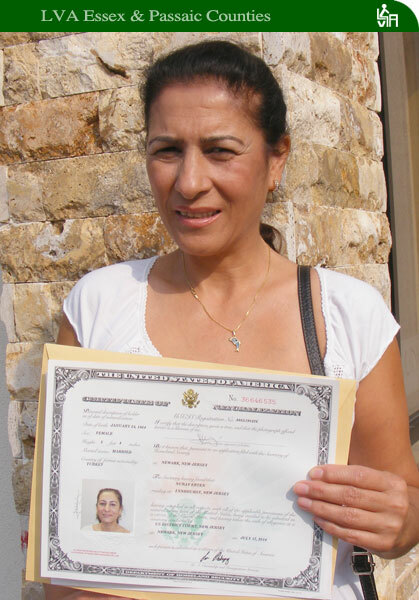 Through conversation, reading, and writing drills, Nuray gained more self-confidence and then decided to go for her goal…United States Citizenship. Tutor and student worked very hard for four months to prepare for the examination. It wasn’t an easy road. Nuray was sidelined when her eldest son was in a very serious construction accident from which he has still not fully recovered. Between her role as a caregiver to her son and work, she stayed up late at night listening to citizenship CD’s. Then she would meet faithfully with her tutor weekly and review the documents given to her by U.S. Citizenship and Immigration Services. They would write out the questions on one side of an index card with the answers on the other side. Then they would stack them in two piles, one with the correct answer and one with the incorrect answer. At first the “incorrect pile” was infinitely larger, but due to Nuray’s determination, quickly diminished. To finally prepare for the test, the pair did role-playing, with the tutor as the examiner and Nuray as the examinee.